Excuse me, I had a difference to settle with the Iron Lady. That Thatcher, what an impossible woman! With her four nuclear submarines inthe South Atlantic, she’s threatening to unleash an atomic weapon angainst Argentina if I don’t provide her with the secret codes that will make the missiles we sold the Argentines deaf and blind. retaking of the Falkand islands would not have been possible that winter. ‘It was at that time that the decision was taken apparently to deploy a Polaris submarine within range of Argentina…It would have been in fact 3,000 miles north of the Falkland Islands’ (p105) but this would still have been well within its range – the target would have been the Argentine military complex at Cordoba (AR p.104). 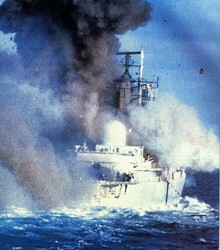 There was a lot of anxiety over the sinking of HMS Sheffield because it carried nuclear depth charges. Swedish ‘Stenor’ ships were employed after the war to salvage something from this ship. 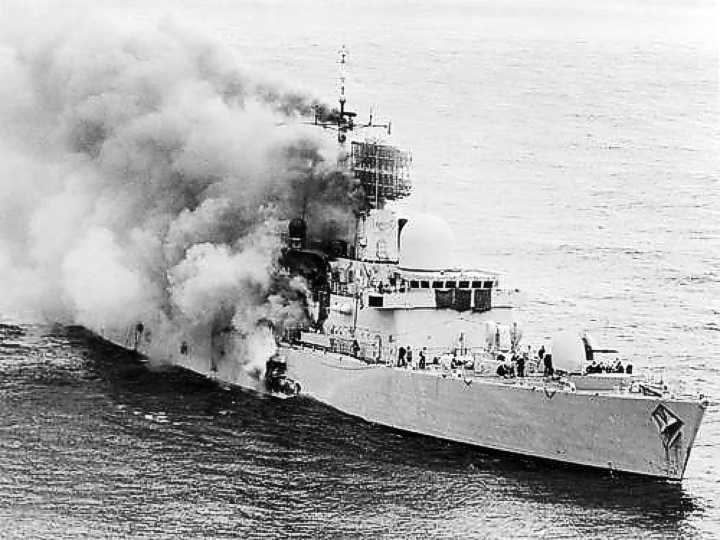 Some have suggested that this was just to rescue codebooks – but, the Sheffield was towed for a couple of days away from the Falklands before it sunk, and why else would they have bothered to do that? Also, it should have been possible to rescue or jettison any remaining documents on board the wrecked ship, if they still remained, during this period. It was not only the Sheffield: A ‘Seasearcher’ was trying to retrieve nuclear devices from the tomb of HMS Coventry as well. Also, nuclear depth charges were lost from two lost Sea king mark 4 and mark-5 helicopters according to Tam Dalyell (Thatcher’s Torpedo, p.33). Did the UK violate the Treaty of Tlatelolco which it had signed and ratified (in 1969)? This declares the whole of South America to be free of nuclear weapons. An entire continent had agreed to remain free of nuclear weapons, by the terms of this treaty. 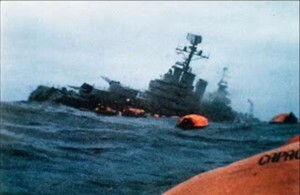 The Argentine government complained that Britain had violated this Treaty, by bringing in nuclear-powered submarines into the area, and thereby sinking the Belgrano. The enforcement body which polices the Treaty of Tlatelolco questioned the British government, and it replied: HMG never answers questions about whether its ships are carrying nuclear weapons, but it has not breached its obligations under the treaty (!). (RA 101) The UK Conservative government claimed to have ‘scrupulously’ adhered to the terms of the Treaty. We note three aspects to the alleged treaty violation: use of nuclear-powered submarines (which HMG claimed were not banned by the treaty); use of tactical nuclear weapons; and use of a strategic nuclear threat ie Polaris. Some British naval ships carried nuclear weapons during the Falklands War, it has emerged. The Ministry of Defence confirmed that it did have some nuclear depth chargers, used for destroying submarines, aboard some vessels in 1982, but there was no question of using them. Nuclear weapons were transferred from ship to ship to prevent any being within a Latin American zone, in accordance with a treaty. This is an outright admission of treaty violation! Note the quote, ‘whether we’d have gone as far as nuclear I don’t know, I doubt it’ (6 minutes). “We did have some being carried with the Task Force and they were being transferred from ship to ship for safety reasons and to meet our obligations under the Treaty of Tlatelolco…. Stuart – would you clarify that? The quote admits that the Task Force carried nuclear weapons into the area designated by the Treaty as being nuclear-free. Why is that not a violation? Another document on the BOI webpages is the “HMS CONQUEROR Op CORPORATE Report of Proceedings covering the period from 6 April to 16 June 1982” also available as a series of pdf documents. It would be interesting to your readership if they were included as a link on your website. Jon is rather over-gentle in his comments, as is Stuart. The task force left its nuclear weapons on Ascension – outside the area covered by the treaty. Your statements here are therefore specious nonsense. BTW – Guess which country wasn’t a Tlatelco treaty signatory in 1982? Yes, that’s right – Argentina. If FOARP is correct this article needs an omission, if Argentina wasn’t a signatory of the treaty then the treaty is hardly enforceable in Argentine waters / contested waters around Argentina. Britain complied with the treaty because the Falklands were part of the treaty area (note that the Malvinas, as the Argentinians are wont to call the islands, would not have been part of the nuclear weapon free zone because Argentina hadn’t ratified the treaty). By stating that the area was covered by the Treaty of Tlatelolco then Argentinians are admitting the de jure British status of the islands despite their de facto occupation of the territory. The Task Force didn’t leave its nuclear weapons on Ascension, that is made clear in the report “The carriage of nuclear weapons by the Task Group assembled for the Falklands campaign” but this report also makes clear the reasons why (not wanting to delay the task force, lack of secure storage on Ascension and lack of secrecy at Ascension), the proscription on taking nuclear weapons into the Falklands Zone and also the fact that this instruction was complied with. I would also give no trust whatsoever to a report saying that we had neutralisation codes for Exocet missiles on 7th May when on 25th May MV Atlantic Conveyor was hit by two Exocets. Bearing in mind that she held vital supplies (Heavy lift helicopters, tents, ammunition, etc, ) and was also capable of acting as a Harrier flight deck, Atlantic Conveyor was a serious loss to British Operations. If we had neutralisation codes we would have used them.